With baseball season starting up, it's been a CRAZY time in our house! Opening weekend was a busy time for us. We had great weather for our walk through on opening night, but our boys didn't have games. Then that Saturday, Kevin won two games and Blake was 2-2 in the COLD, FREEZING rain! We were at the ballpark from 9 a.m. until nearly 8 p.m. With Blake's team out of the tournament, he was able to watch Kevin's team play FOUR games in a row on Sunday to win 2nd place. Luckily we had beautiful weather that day! 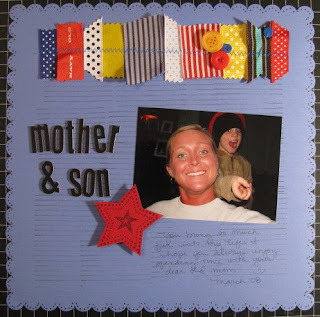 I participated in an online crop at http://personalscrapper.com for National Scrapbook Day. I was able to finish all 18 of their challenges for the weekend. I'm posting some of my favorites below. 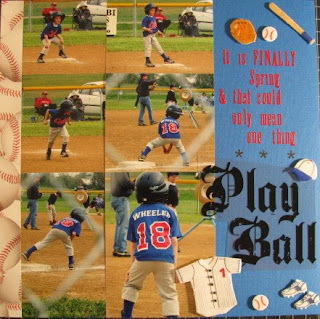 This "Play Ball" layout was based on a sketch. Instead of using one large enlargement, I used 6 smaller photos of Kevin during the opening weekend tournament. When I lifted a DT member, I selected photos of me with my aunt Sandy and cousin Tiffany. 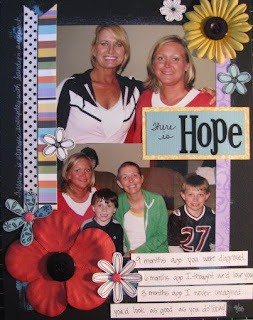 Tiffany was diagnosed with Glioblastoma Multiforme (stage 4 brain cancer) in July. She's had a long fight trying to "Kill Ted" (the tumor). I'm so proud of them both. I think they are the strongest two people I know. Here is another opening weekend layout, "18 Wheelers". 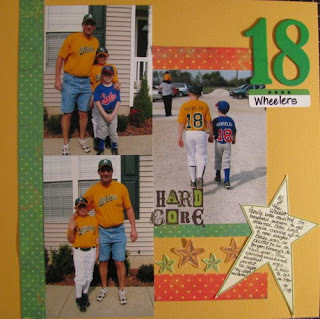 Both boys use the number 18. This page is for Blake's album. I used the April kit from Personal Scrapper for this one. This photo of Blake in "Stop!" just cracks me up. Sometimes I know they get tired of me taking so many pictures, but for the most part, I think they really appreciate that I do so much and I know they love their scrapbooks! "Messy" was a quick under 30 minute page. I lifted this idea from the new Scrapbooks, Etc. magazine. This is Blake goofing off after one of the ballgames last summer. For the ribbon challenge, I used a self-portrait of me and Kevin. This is another lift from SBE's latest issue. It's one of my favorite pages from the weekend. I used my new sewing machine to sew the ribbons on. Talk about feeling old, my baby sister went to Prom a few weeks ago. I realized at her graduation later this month, I will be one year younger than Mom was sitting at mine! Here is a shot of us together before she left for prom. A classmate of hers said we looked just alike. We don't! But, it sure was flattering! Oh, and I lifted this from SBE, too. 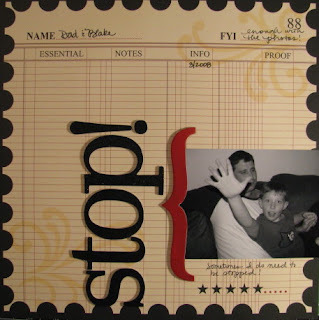 We had a "no adhesive" challenge, so I only used staple and brads to adhere everything to this "happy" layout. There is hidden journaling on the tag inserted behind the photo. Aside from scrapbooking, we went to the zoo with Kevin's kindergarten class. That was fun! We celebrated Mother's Day in Evansville with Grandma Rosemary a week early. The boys got to go fishing there. Everyone caught a fish but me! I just had a turtle chasing my bobber! Blake took a field trip to Bernheim, but it was the day after a huge rain, so I skipped that one. Tom and the boys spoiled me for Mother's Day. They sent me for a "La Stone" massage, manicure, and pedicure. While I was at it, I also chopped my hair off...short. I love it! The school year is wrapping up. The boys will have field day and awards ceremonies next week. I'm really looking forward to having them home for summer break! this one is my fav. you rock.